​Just about any color you want. Our Memory Walk brick fundraiser is an ongoing fund raiser. In the spring of 2016 a brick walkway was added to our landscaping projects. We had several loads of bricks donated by supporter Laurel Magee and we are selling new bricks to add to our walkway 'in memory of' a person or pet . Honor a special pet or person and purchase a Memory Brick for a donation of $100 or more. There are 3 lines allowed and each line has up to 20 spaces. If you want a logo of paws or heart then it narrows the wording to 14/15 spaces per line. ORDER YOUR BRICK NOW. 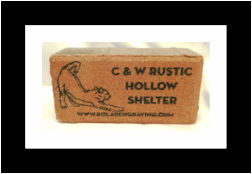 Mail your donation to C & W's Rustic Hollow Shelter, P.O Box 67, Nashua, IA 50658-0067 and include what you want on your brick. For your convenience, you can also order online! The Gold Rush began in California January 29, 1848 (to 1855). C & W's GOLD RUSH begins NOW, in 2015. I would like to thank one of our supporters, Diana Olinger, for suggesting this fund raiser to help the special needs felines at C & W. We really appreciate ideas from anyone. So, what IS our Gold Rush fund raiser you ask??? Diana suggested everyone look through their jewelry boxes for old jewelry that contains any karat of 'gold' that you haven't worn. Maybe there is only one earring or it is outdated... or you find an old gold watch that no longer works that has gold on it. The back clasps of the earrings may also have gold on them. So look closely at any miscellaneous jewelry items that you no longer wear or are broken. Look for gold. The only thing we need is jewelry that has a mark of 5k, 10k, 18k or 24k or other karats. Thanks for helping us with our GOLD RUSH this year. It is an ongoing fund raiser, so please share with your family and friends. It's just another way to help the felines at Rustic Hollow Shelter. We do at least three online auctions a year at the BiddingforGood site online. We want to thank everyone for the items they donate from hand crafted quilts and jewelry, to antiques & collectibles; original artwork/paintings.... Any item that can be mailed and is in new or good condition would be appreciated. CHECK OUT 'NEWS FROM RUSTIC HOLLOW' SECTION ON OUR WEBSITE TO SEE OUR LATEST FUNDRAISERS!!! Our November 2018 online auction will start November 17 and end December 1st.. The link is: www.biddingforgood.com/rustichollowshelter. You can go in now and preview the over 300 items on this upcoming auction but you cannot bid until the 17th. We always need items for our auction. If you have items to donate for our auction, please email and let us know. Our auctions include: Jewelry (old and new); handcrafted items; books; home decor; clothing (new or gently used); collectibles and figurines (cat collectibles go well); and just about anything we can mail out. The auctions put the 'fun' in 'fun'd raising!